The lone explorer has been drifting alone in the cosmos for months now, never to return to Earth. Now SpaceX’s Starman has gone even beyond the orbit of Mars. In February, the first test flight of SpaceX’s Falcon Heavy rocket carried with it a unique cargo: Elon Musk’s cherry red Tesla Roadster carrying Starman, a dummy dressed in one of the rocket company’s prototype spacesuits. 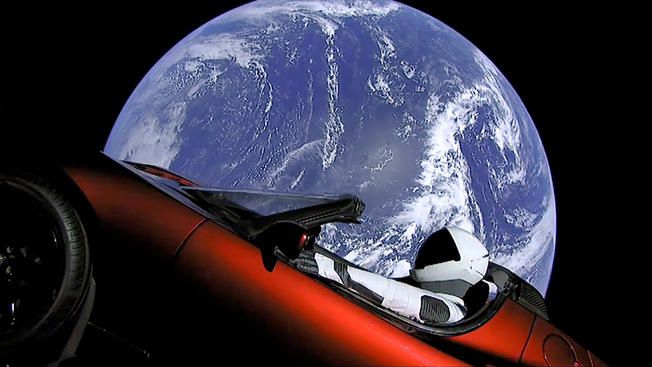 Starman and the Roadster will drift around the solar system for potentially millions of years. SpaceX just announced that Starman has made it past Mars for the first time. The dummy and car will spend all that time drifting between the Earth and Mars, occasionally approaching but never orbiting either planet, in what is called a trans-Mars injection orbit. This orbit makes it easy for spacecraft to transfer between our neighbourhood and the Red Planet. On Friday, the lonely craft completed the first leg of that journey as it passed beyond the orbit of Mars. SpaceX decided to use Starman and a Tesla Roadster for the test payload—instead of a traditional one like a concrete block—in part because it was fun, but also to test the prototype spacesuit Starman is wearing. As part of NASA’s Commercial Crew program, SpaceX will be sending astronauts to the International Space Station, and they will be wearing that spacesuit. This is SpaceX’s chance to test the suit in the vacuum of space. In the future, SpaceX hopes to use the Falcon Heavy to launch larger satellites into Earth orbit and on missions to Mars. The second test launch of the rocket is currently scheduled for 2019, although there’s no word about what the payload will be.